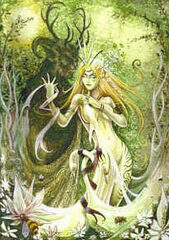 Beltane celebrates the renewal of life. Flowers emerge, birds begin to nest, and here on Vancouver Island the Coven moves outdoors to celebrate. In the Wheel of the Year the Goddess and God reach young adulthood; both are in their green prime, they become lovers and consummate their union. Beltane is the beginning of the light half of the year, the polar opposite of Samhain. It is a Lunar or Grand Sabbat held on May 1, a time of joy and celebration; the dark of winter is forgotten, and summer is coming! It is a time for us to renew our bond with the Faerie Folk with offerings given at each gathering. We welcome them to the garden, deal fairly with them and expect them to deal fairly with us. The Fey can be tricky, one must always be aware that they have different codes of conduct than we humans. They enjoy our offerings, ritual, music and laughter and they will even allow us to take a picture or two of their Altar, but after a time the camera will no longer work and they let us know that it’s time for us to respect their privacy. As part of our Ritual celebration we dance the ancient mystery of the Maypole, the sexual joining of Goddess and God. We wind the red and white ribbons in the pattern of a spiral as we dance, the spiral reveals the mystery of the serpent; the coiled Kundalini energy that awakens and arises to unite with Deity. As we dance we echo the ancient pagan dances around a living tree, a magick to ensure fertility in the coming planting season. The Maypole is garlanded with flowers to represent the fertile powers of nature and our ribbons ensure protection as we bind the spell, weaving Life with Nature, Goddess with God and Earth with Sky. Our ribbons are the traditional red and white. Why white and red? Consider the union of the Goddess and God at Beltane. They are young and lusty adults coming into their first flush of sexuality. The white ribbon represents sperm; the red ribbon represents Moon blood. In the old days the couples from the May Pole Dance, and any other couples who felt so inclined, took the energy and moved it out into the fields for an evening of love-making; a sympathetic magickal prayer to the Earth for fertility of crops. An integral part of any Beltane celebration is fire! The word Beltane means “bright fire” and refers to the bonfires lit during the May Rites. Herds of cattle were ritually driven between two bonfires to purify and protect the livestock and to ensure their safety and fertility throughout the coming year. The warmth from the bonfires echoed the renewed warmth of the sun, and the promise of summer crops. Unfortunately the Coven owns no herds of cattle and our pets seem to take umbrage at the idea of being driven between two raging bonfires. The fire is lovely on a chilly Island May evening however, and we thoroughly enjoy making merry around it. It is said that the Druids used the Beltane fires in a magick to draw the Sun towards the Earth. The fires were laid ritually by first cutting away the turf in a circle or square and leaving a block of turf in the centre. Wood was laid in a cross hatch pattern and was decorated with wool ribbons and hawthorn flowers. At a given signal all the village hearth fires were extinguished and the villagers gathered around the laid bonfire. The bonfire was then kindled by the old fashioned method of wood friction or flint sparks. Excitement began as people thrust brands into the newly roaring flames and whirled them about their heads in imitation of the circling of the sun. Young men leaped the fire backwards and forwards, three times for luck. As the fire died down, the girls jumped across it to procure good husbands and easy births. The villagers then prepared and shared a feast of eggs, milk, oats and butter with oat cakes. When the festivities ended the ashes were spread over all the fields to bring fertility to the land and embers were taken home to kindle the new fire in the hearths.